Grants from these funds, normally of the order of a few hundred pounds, are available to support geological field work at home or abroad. 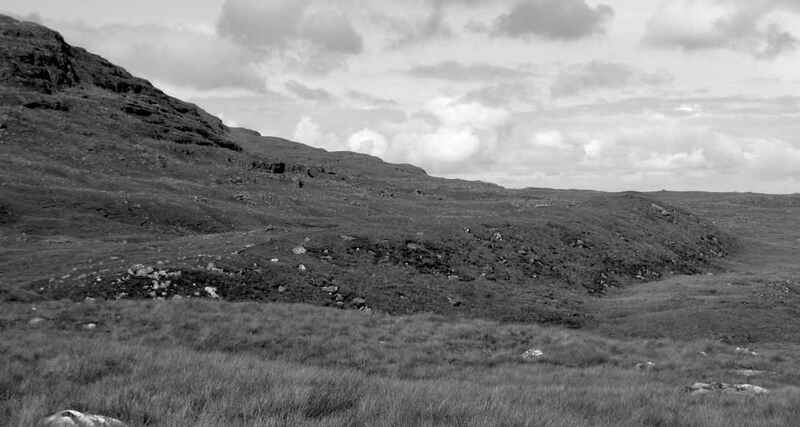 Grants from the Clough Fund may be awarded for fieldwork or other geological enterprise in any area, provided that a suitable Scottish connection can be demonstrated through the recipient or their institution, or through the work itself. Grants from the Mykura Fund are restricted to geological fieldwork in Scotland, with preference given to workers under 35 years old. Further information. Figure 1: Steeply dipping fault in ultramafic breccia on the slopes of Ruinsival, Rum. 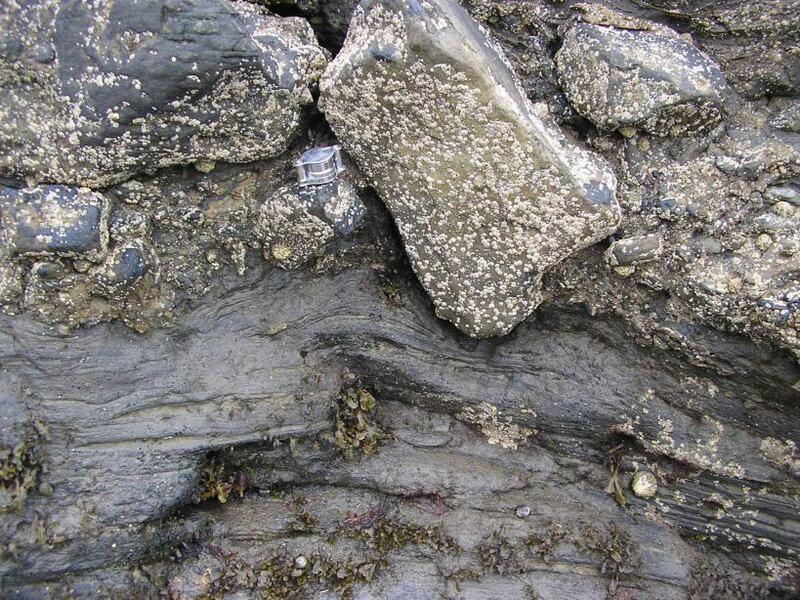 Andrew Bell was awarded funds to study brittle deformation features on the Isle of Rum. Despite some recent advances, the origin of patterns of seismicity and ground deformation at active volcanoes is generally poorly understood. 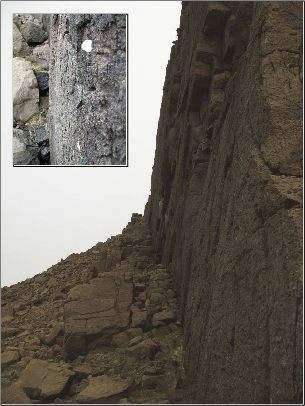 The Isle of Rum provides an opportunity to examine in the field the faults and fractures that would have been responsible for controlling deformation and generating volcano-tectonic earthquakes when the volcano was active. Fieldwork focussed on a search for brittle deformation features in the central region of the layered ultramafic intrusion. 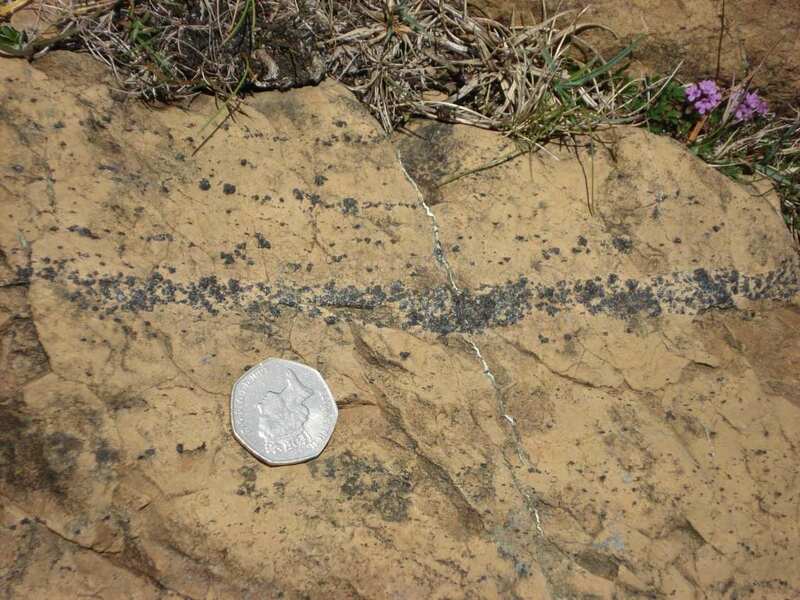 Populations of significant (>100m in length) faults, with a range of strikes and dips, were identified within ultramafic breccias (Fig. 1). Mapping these features will constrain the relative timing of faulting with respect to specific magmatic events and allow quantification of the population statistics. 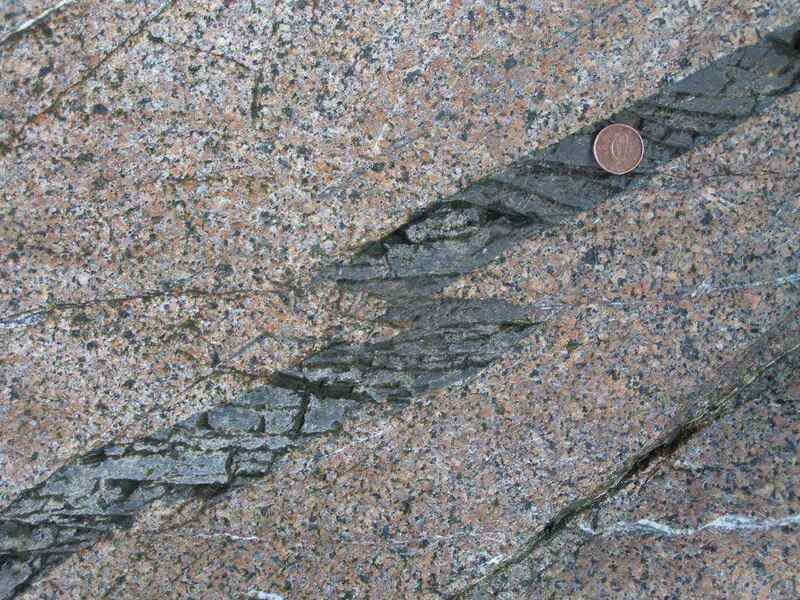 In the Long Loch fault zone, there is clear evidence of alternation between brittle and ductile shear deformation within partially consolidated crystal mush, suggesting faulting contemporaneous with magmatism (Fig.2). The major fracture lineations in this zone that are visible on satellite images can also be traced in the field. On the basis of this visit, plans are being developed for further data analysis and modelling. Future field studies of the Rum volcano are likely. 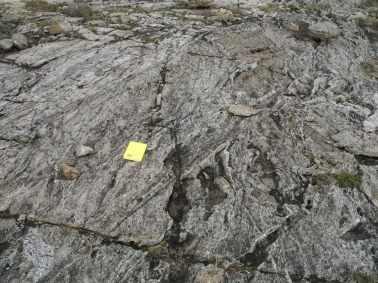 Figure 2: Interrelated brittle and ductile deformation processes in ultramafic breccia, Long Loch fault zone, Glen Fiachanis, Rum. Dome seen from over-flight- Photograph taken from the over-flight showing the crater. The current dome has an intriguing flattened top surface and the colour variations (light/dark) are due to the differential heating of the dome from below. Fumaroles are seen around the crater rim. As an essential part of my Master’s Thesis, field work was undertaken at Volcán de Colima between the 21st of June and the 6th of September. Volcán de Colima- located in the Trans-Mexican Volcanic belt- is a typical subduction-originated calc-alkaline volcano. The recent history is one of distinctive episodes of effusive and explosive activity. In 2004 a substantial block-lava flow was extruded, reaching 2200m from the crater while in 2005/06 major explosive activity ensued, characterised by extensive ash clouds and pyroclastic flows. The project aim was to constrain the dynamics of dome growth for the current lava dome. Growth began in 2007, and as of September 2010 it continues to grow in size although the effusion rate has noticeably decreased. The dome now partly fills the crater and the overhanging debris cascade down the south/southwestern flanks as rockfalls. Fieldwork was undertaken to collect infrared thermal data of the volcano. 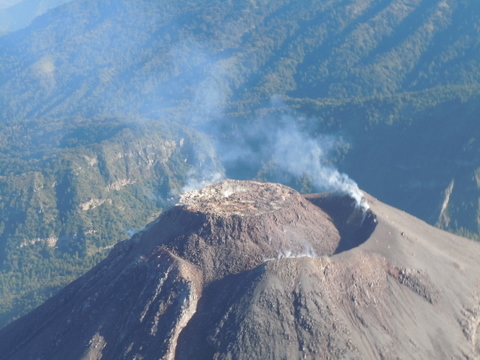 Images were collected from flights over the volcanic edifice and from overnight trips to the extinct Nevado de Colima, 6km to the North and where a permanent Protection Civil base is located. 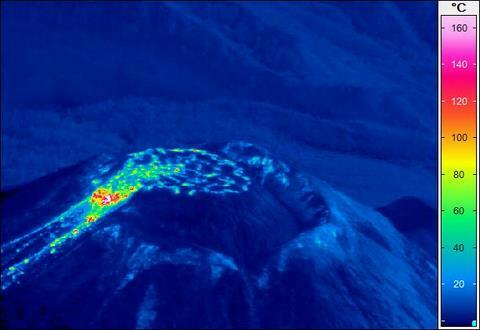 Dome Thermogram from over-flight- Thermal image of the andesitic dome at Volcán de Colima, heat flux is significant through the flattened dome top but greatest through the lobe where hot debris is shed down the flanks. Rockfalls of hot material create remarkable incandescent trails on the slopes of the volcano when observed at night. The thermal data from the flights show heterogeneous temperature profiles. Features such as hotspots, ash rings and depressions on the dome surface can be readily identified. In addition time series can be generated to show max/mean temperature, heat flux and effusion rate to potentially reveal if there exists obvious systematic change during this effusive episode. Thermal data from Nevado de Colima can be used to monitor fumaroles temperatures, this will be analysed to constrain if there exists any relationship between the internal plumbing systems of the dome and fumaroles. Infrared data may be of particular use in giving insight into volcanic activity and processes, making it an increasingly integral component of the continued monitoring effort. 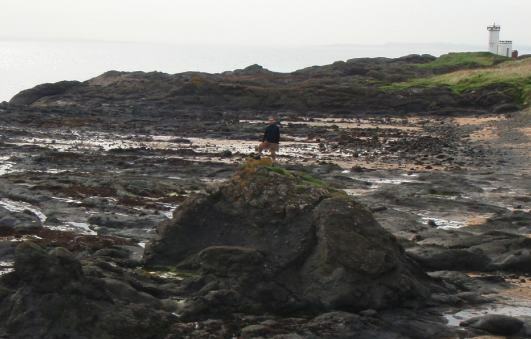 Thomas Gernon (now at the University of Southampton) was awarded a grant in 2008 to study the volcanic geology of the Elie Ness diatreme, East Fife. Diatremes in this region have received little attention, but may provide insights into the architecture and internal workings of other types of volcanic vents. During August and September 2008, the volcanology of the diatreme was rigorously reevaluated, using a combination of detailed mapping techniques and sampling. Preliminary results from the mapping demonstrate that the diatreme had a protracted history of eruption and infill, involving contamination from a neighbouring vent. Petrography of the different units is currently being undertaken, and a paper is in preparation. The author would like to thank the Geological Society of Edinburgh for supporting this research, which will help build a new and detailed picture of the processes and interactions of alkali basaltic diatreme-crater systems. 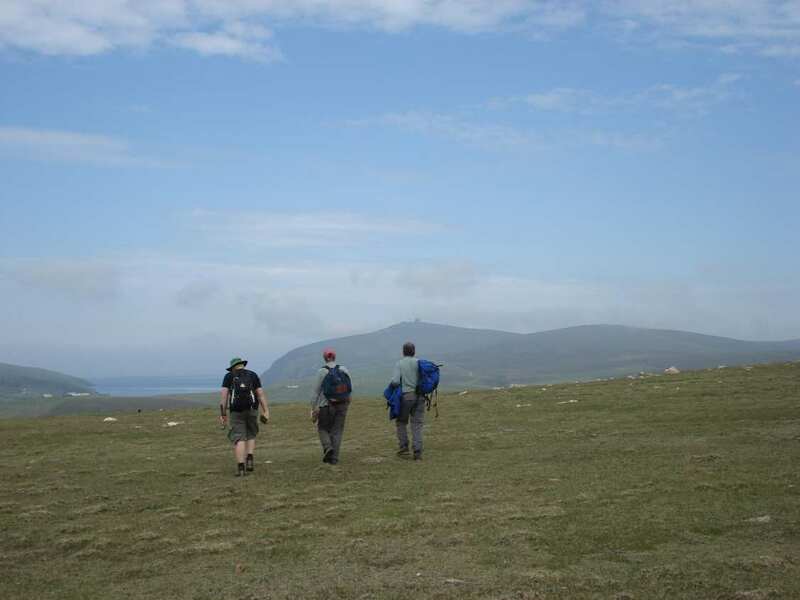 Brian O’Driscoll was awarded funds from the Mykura Fund to support ten days fieldwork on Unst (Shetland Isles) in July 2009. Together with colleagues from the University of Maryland (USA) and University College Dublin (Ireland), sampling was carried out across the lower portions of the ophiolite ‘klippe’ that is exposed there. This sampling focused on the section of the ophiolite that exposes the petrological Moho, where there are primary mantle heterogeneities preserved. In particular these include sequences of interlayered dunite and harzburgite that are believed to reflect varying degrees of partial melting at an ancient ocean-spreading centre. Abundant podiform Cr-spinel seams are also associated with this layering, and were also sampled. In September 2009, the samples were measured for Re-Os isotopes and highly-siderophile element (HSE) abundances at the University of Maryland. This data was combined with Cr-spinel mineral chemistry and in situ LA-ICP-MS measurements on sulphides and arsenides to investigate siting of the HSE. A complex history of ancient melt depletion, melt-rock interaction and sulphide metasomatism has been revealed. It is envisaged that this study will be relevant to deciphering mantle events preserved in other ancient ophiolites. Fig 1. Sandstone outcrop of the Allt na Cuile Formation, SW of Lothbeg Point. Adam McArthur was awarded a grant from the Clough fund in 2009 to support a field study of the Upper Jurassic Helmsdale Boulder Bed Formation in Sutherland, NE Scotland as part of his PhD project. The project is designed to integrate sedimentology with palynology to enable a better understanding of depositional systems and palaeoenvironments. 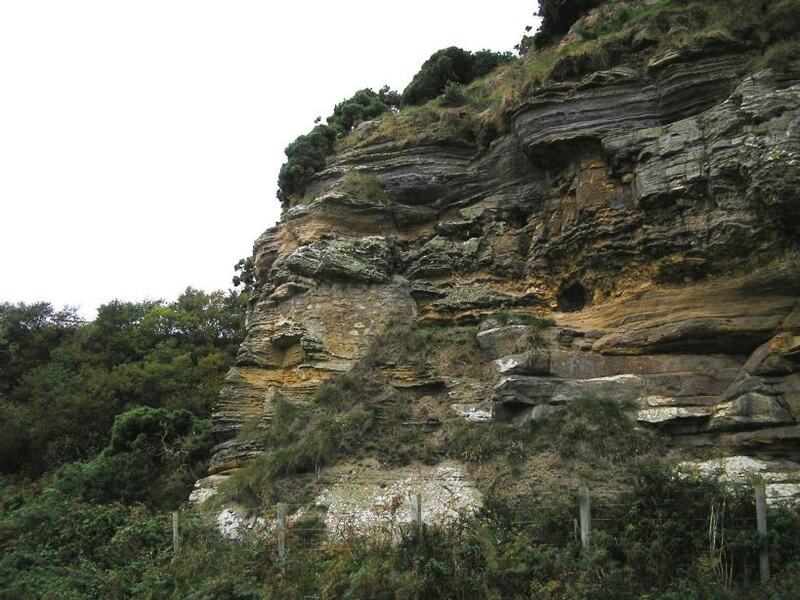 Fieldwork was conducted over three weeks during April 2009 on the edge of the Inner Moray Firth Basin, which was an active rift basin during the Upper Jurassic. The entire Helmsdale Boulder Beds Formation, over 18 km of outcrop was logged in fine detail, totaling a sedimentary log 915 m thick. Each lithology was recorded, enabling the identification of thirty six lithofacies and seven key facies associations; siliciclastic siltstone, tiger stripe, sandstone (Fig 1. ), siliciclastic boulder beds, calcareous siltstones, bioclastic turbidites and bioclastic boulder beds (Fig 2.). Fossil wood samples from the boulder beds were collected for a dendrology study of tree growth in the Upper Jurassic to assist environmental analysis. Palaeocurrent data was recorded at every opportunity, principally from echinoid spines within the sandstone and bioclastic turbidites. Furthermore 32 samples were collected at regular intervals and points of stratigraphical interest from the siltstone facies for palynological analysis. Palynological samples were processed at the University of Aberdeen and were used to identify a wide variety of over 130 palynomorphs. Fig 2. Very poorly sorted and ungraded bioclastic boulder bed comprised of large angular clasts of Caithness Flagstone within a bioclastic matrix, the emplacement of which has deformed underlying calcareous siltstone. Located on the Helmsdale shoreline. Ian Alsop (now at University of Aberdeen) was awarded a grant from the Clough fund, which was used to explore structures in the Zechstein salt at a mine in Bex, Switzerland and compare these structures with folds and fabrics developed in metamorphic rocks. The salt displays structures associated with deformation in the northern Alps and Jura mountains. A variety of detailed structures were observed within halite, gypsum, anhydrite and marl layers. The main features observed include: 1) Boudinage of more competent marl layers to form “boudin trains” (see photo). 2) Intense isoclinal folds. 3) Aligned pressure shadows around marl clasts to define a lineation. Collectively, these structures indicate that the salt was undergoing complex flow, with zones of both intense boudinage indicating layer extension, coupled with marked isoclinal folding reflecting contraction. 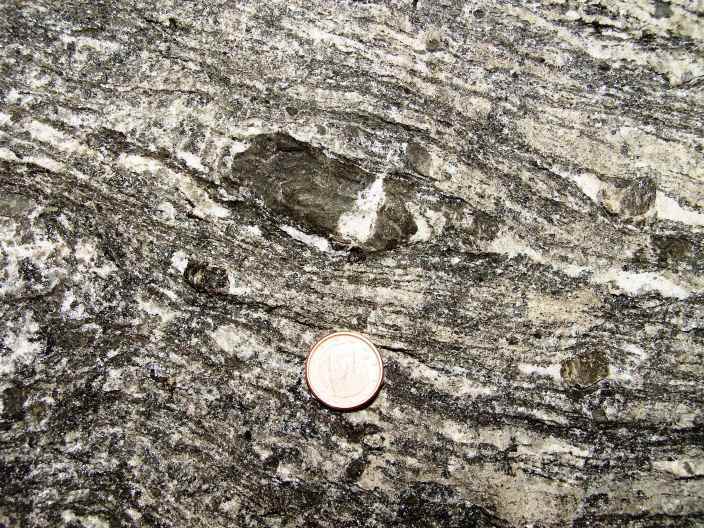 Similar complexities are frequently observed within high strain zones developed in metamorphic rocks. Models of perturbations in flow developed in ductile shear zones may thus be equally applicable in salt tectonics. In 2007 Colin Ballantyne received funds to support fieldwork in Wester Ross, northwest Scotland. This involved collecting 20 samples for cosmogenic 10Be surface exposure dating, to calculate the timing of a glacial readvance in this area at the end of the last ice age. Provisional results from 9 samples suggest that the readvance occurred around 13,000 years ago, significantly later than had previously been supposed. The western part of the Applecross moraine, deposited by a lobe of ice to the right (north) of the moraine. 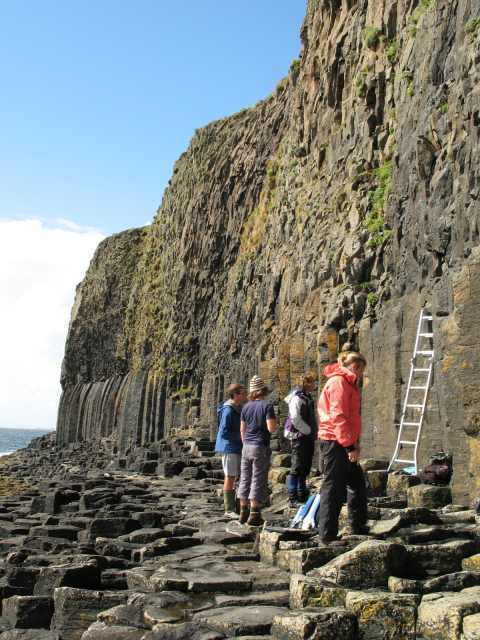 Madeleine Humphreys was awarded a grant in 2007 to fund a group from the University of Cambridge and the University of Bristol, to undertake a study of columnar jointing in basalt on the island of Staffa. Despite recent advances, there is still considerable debate over the formation of these spectacular joint patterns. Fieldwork was carried out during August 2007. The group camped on Staffa for 6 days, and carried out sampling and measurements of the columns as well as mapping of individual lava flows. Results are now being analysed, and it is expected that the conclusions will be applicable to other areas. Ian Alsop received funds for fieldwork in Donegal. The objectives of this fieldwork were to gain a better understanding of (1) Extensional ductile structures related to possible orogenic collapse of the Dalradian and (2) The timing and kinematics of granite emplacement. This research has resulted in a paper entitled “The brittle evolution of a major strike-slip fault associated with granite emplacement: A case study of the Leannan Fault, NW Ireland” (Kirkland, Alsop & Prave 2008. Jour. Geol. Soc., vol. 165, pages 341-352) with another paper on ductile structures planned. Sinistral shearing the Tullagh Point Granite. 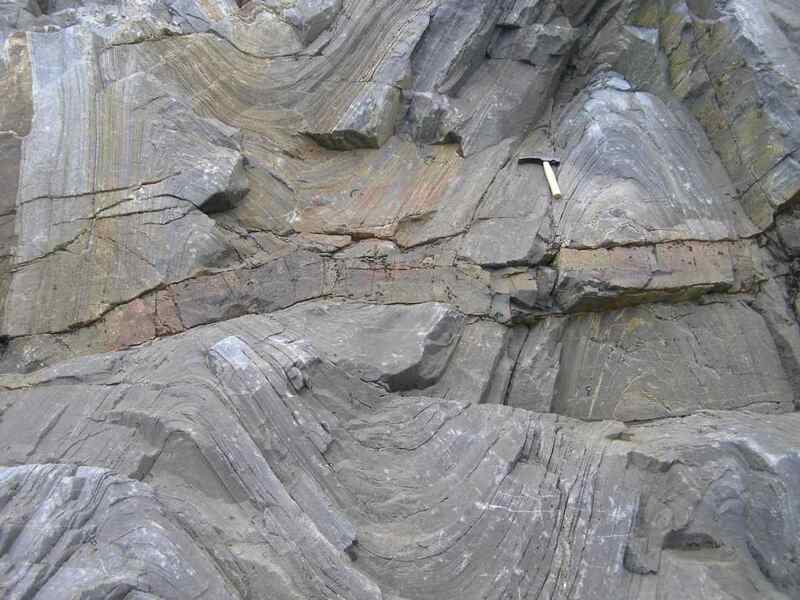 Post-tectonic lamprophyre cross-cutting folds in the Dalradian.